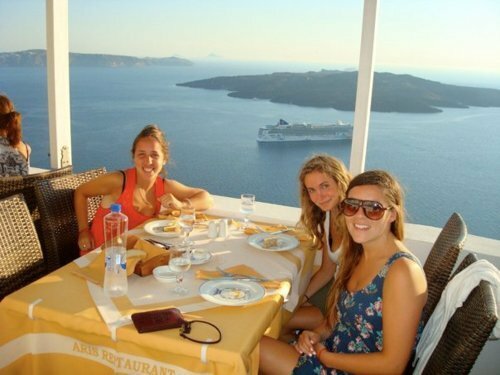 Last summer, two of my best friends, Cassi and Cassandra, and myself took a trip to Israel and Greece. 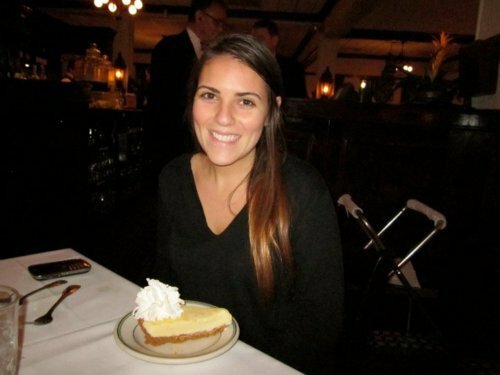 The sightseeing and relaxation was incredible, but as always, I had my eye out for some good eats. Cassi and Cassandra love food as well, so I knew they would join me in my search for everything delicious! 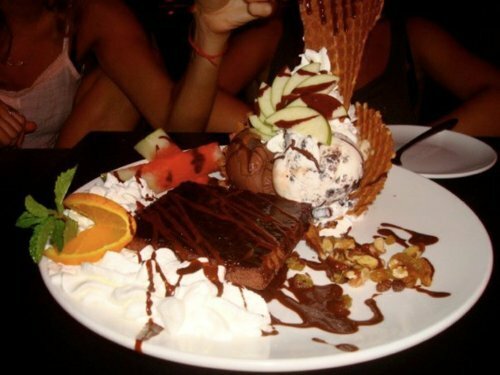 If you love chocolate, I suggest you take a trip to Max Brenner. This location was in Tel Aviv, Israel, but they have locations all over the map. It is a chocolate restaurant, including dishes from crepes, to milkshakes, to fondue, to cocktails, and to anything imaginable. They do also have a savoury dinner and brunch menu which can be enjoyed as a prelude to the ultimate chocolate experience. The restaurant’s chic interior definitely adds to the chocolatey experience. 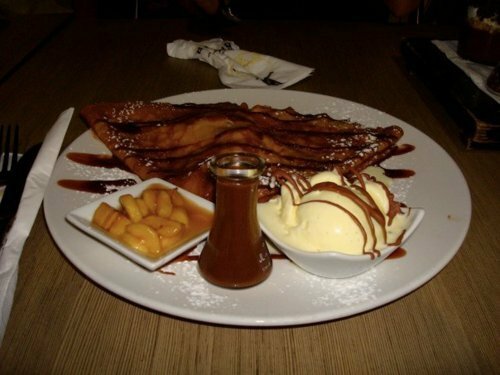 Pictured here is a banana crepe drizzled with what else, chocolate, served with vanilla ice cream. Now is this a dessert or what?! A warm, gooey brownie, topped with walnuts and chocolate sauce, paired with cookies and cream and chocolate ice cream all in a waffle bowl topped with various fruits. This was amazing!! 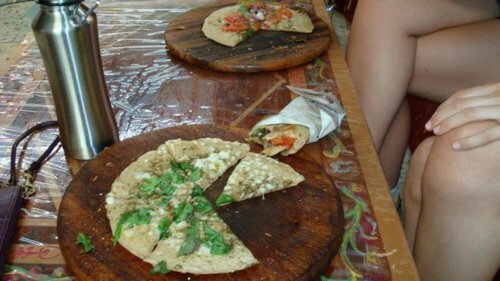 In a small area in Israel called Tzfat, we came across this delicious, pizza-like item. It is like a flat pita/tortilla with various spices which are popular in Israel such as za’atar. It is topped with basil, and usually tomato (I omit the tomato due to preference) and a variety of cheeses. The three of us were starving, and this definitely hit the spot! Next, we took our travels to Greece. 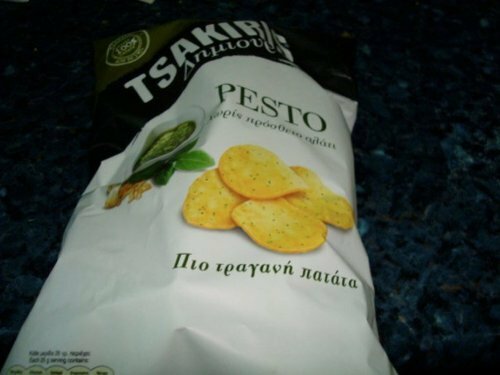 Since I am a HUGE fan of pesto, I was super excited to find these chips. The three of us absolutely loved this unique flavour , so of course we wanted more. As we continued our way through Greece, we were constantly searching for these, but sadly, they were nowhere to be found. These chips will forever be missed! What’s better than breakfast by the beach? This waffle by the beach! 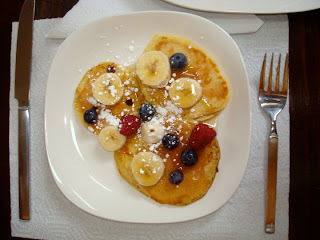 I have eaten quite the amount of waffles in my day, however this tops my list. Something about the warm, crispy outside, yet perfectly soft inside, smothered in nutella and fresh fruit literally made me dread the last bite. Loukoumades are a traditional Greek dessert. They are fried balls of dough soaked in honey, and usually sprinkled with cinnamon. 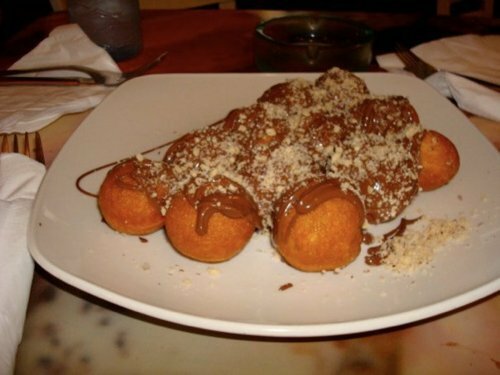 These particular ones were stuffed and topped with nutella. I thank Cassi for introducing me to these. 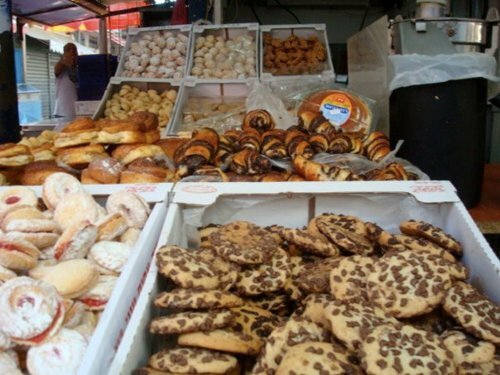 They are so traditional that they were difficult to find, yet we were determined, and came across a few bakeries who made them fresh to order. I would go back to Greece just for these! This wonderful photo was taken at the Shuk. It is an Israeli market with basically anything imaginable. There was jewelry, antiques, any kind of food-desserts and pastries, candies, fruits, vegetables, meats, breads, spreads, and the list goes on. Cassi, Cassandra and I visited this market on a number of occasions whether it was just to browse, grab breakfast, or get snacks to bring to the beach. During my Spring Break Jonty and I decided to take a trip to Miami to scope out the edible possibilities. We knew that the United States was a great destination for all things food. 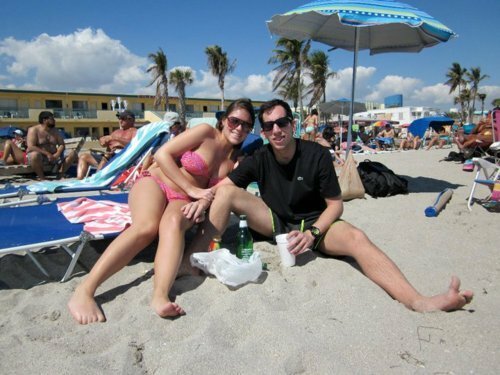 Although I go to Miami once a year during Winter break, I decided that it was time Jonty experienced this for himself. We basically dedicated our entire trip to satisfying our taste buds. This is going to be a long post with many pictures because it is crucial that we leave almost nothing out. Keep in mind we were only there for a week! DULCE DE LECHE CHEESECAKE!!!! 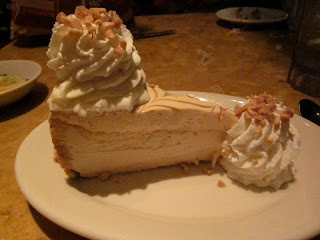 This is not only my all time favourite cheesecake at The Cheesecake Factory, but I would say it is my favourite thing to eat overall! The smooth, silky, creamy consistency and swirls of caramel truly make my mouth water just at the thought of it. 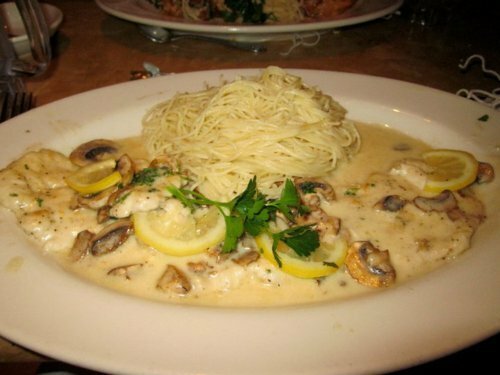 As for savoury dishes at The Cheesecake Factory, this is my pick-Chicken Picatta. This dish comes with chicken breasts, topped with angel hair pasta in a creamy lemon sauce with mushrooms and capers (I usually hold the capers). Jonty decided to go for the Shrimp Scampi. 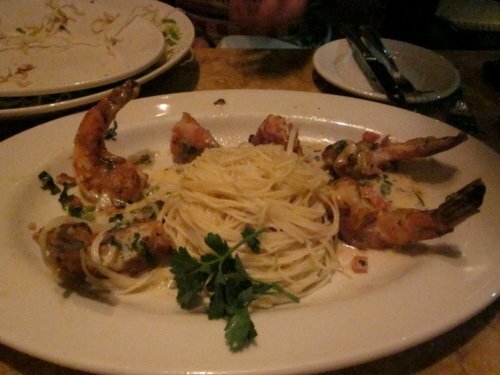 Lightly battered shrimp tossed in a cream sauce, served with angel hair as well. As we continued eating our way through Miami, we decided to give The Cheesecake Factory’s sister company, The Grand Luxe a try. 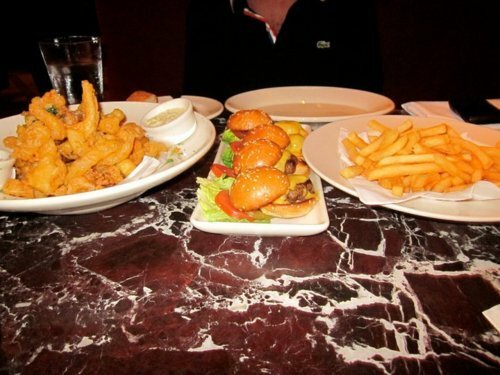 Pictured here we have calamari, shrimp, and assorted vegetable tempura, cheeseburger sliders, and no burger is complete without a side of fries. Next of course comes dessert. 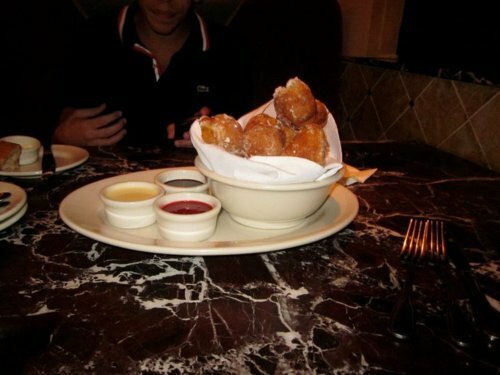 These beignets are one of their made-to-order desserts which are to die for. The hot, sweet dough dipped in either vanilla, chocolate or strawberry sauce was quite the party in our mouths. My grandparents were also in Florida while we were so they insisted on taking us out for dinner. We went to a restaurant called DiSalvos. We ordered a fried platter for the table which included fried calamari, fried mozzarella, and fried ravioli. 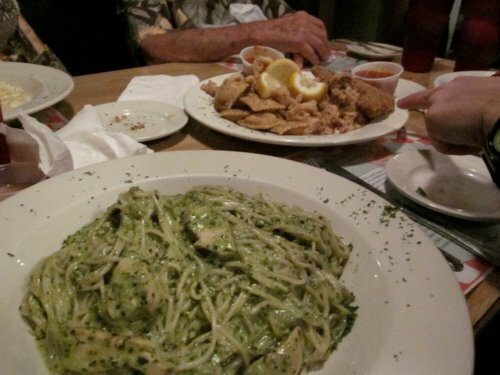 Also pictured is one of my favourites, a chicken pesto spaghetti. According to my grandparents, a trip to Florida is not complete without visiting Moe’s for breakfast. 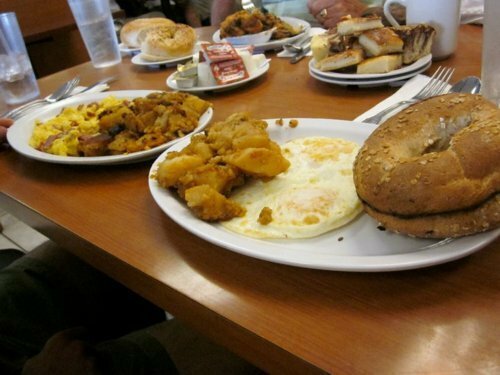 It is a very casual deli with food that will not disappoint. We have here scrambled eggs with salami and home fries. 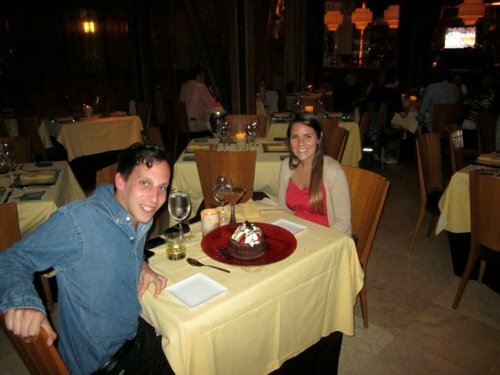 Jonty’s birthday happened to fall during our vacation, so I decided to take him to one of my favourite South Beach spots, Sushi Samba. 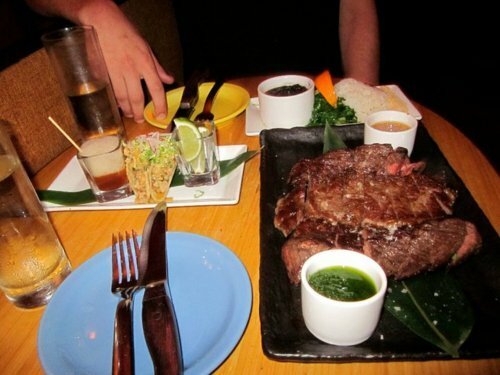 Pictured here is a Brazilian skirt steak cooked to a juicy medium perfection alongside tuna tar-tar tacos. 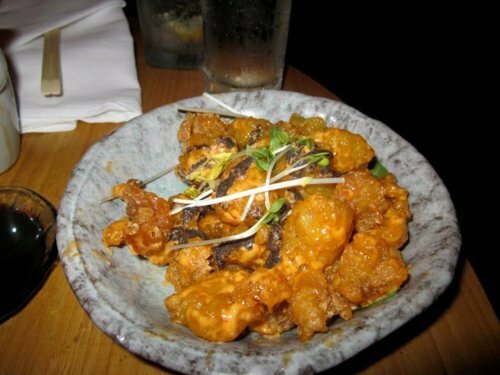 As well we have a classic necessary dish (in my opinion), the rock shrimp tempura which is slathered in a spicy creamy yet tangy sauce. It is nearly impossible to leave Florida without indulging in a piece of their world famous key lime pie. Most restaurants have their own version and recipe, but my favourite and highly rated is the one at Joe’s Stone Crab in Miami Beach. The combination of the buttery graham cracker crust and the smooth lime filling makes for one perfect ending to any meal. After long days lounging by the pool and browsing through malls, it definitely works up an appetite. Flashback diner is open 24 hours and is always a great spot for a late night bite. 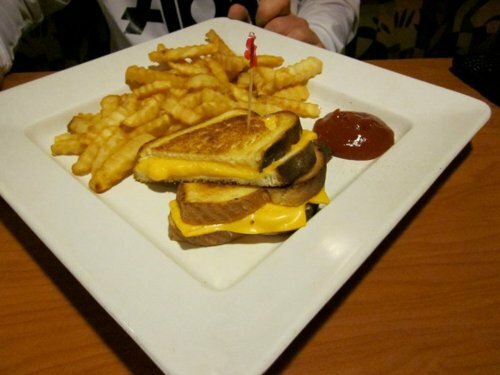 Featured above is the classic grilled cheese with crinkle cut fries. 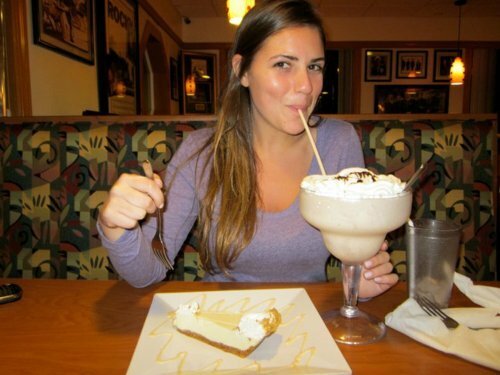 My addition to the meal was this giant milkshake and key lime pie, yet again. I requested a cookies and cream milkshake, which they did not have so I settled on chocolate. However, when the waitress brought it over, she told us that she secretly concocted a cookies and cream milkshake just for us. It was delicious and we are ever so thankful!! A truly unique, elegant and extraordinary experience! Barton G serves every dish with a wild presentation. 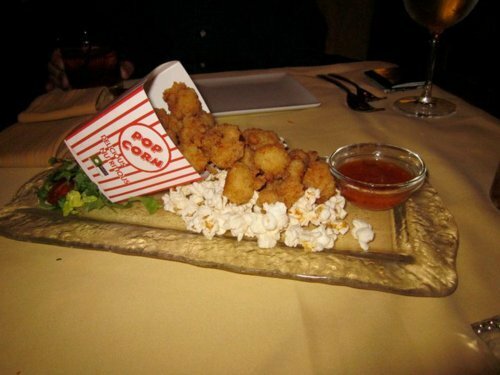 Pictured here is the popcorn shrimp served in a popcorn container along with what else than real popcorn. The dessert is a colossal warm brownie stuffed with cheesecake and topped with ice cream, strawberries, and whipped cream!!! I think that speaks for itself. It is such a jaw-dropping experience to watch the waiters deliver your food, along with everyone else’s in the restaurant. 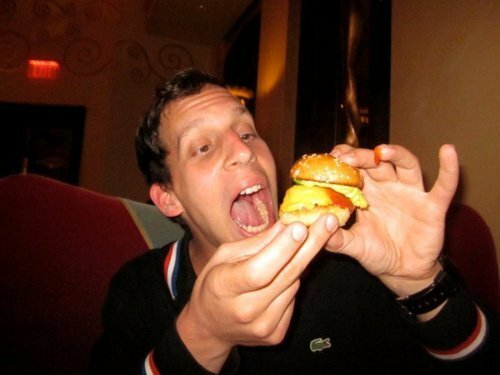 Jonty and I have eaten countless burgers. However, this is one of our faves. 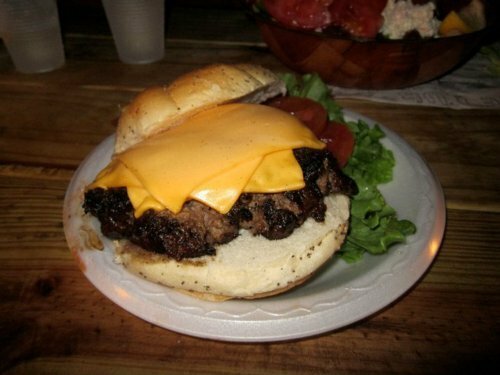 The thick, juicy, cooked to perfection burger at Le Tub in Hollywood, Florida is a must-eat. Listed number one in GQ Magazine for “Best Burger” and featured on Oprah, it definitely lives up to its hype. 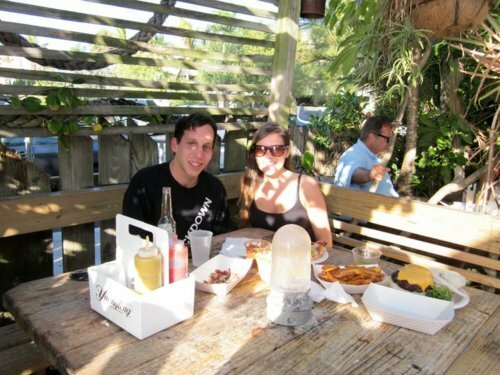 This restaurant is a very casual outdoor scene on the intracoastal with picnic tables and water in serve-yourself picnic jugs. It is seat yourself, and the wait time for a burger is usually close to one hour. The menus are folded, handwritten white paper, the cutlery is plastic, and they only take cash. This place is like no other, truly unique and perfect for a sunny, warm Florida afternoon, or gorgeous evening. I cannot possibly post every single thing we indulge in, so I have decided to start with last summer. My cottage is about an hour and a half North of Toronto. It is where my parents spend most weekends, and where I tend to visit a couple of times a month as well. While Jonty and I went up last summer, we debated going out to a restaurant, or cooking the ultimate feast of our own. We decided to get creative and have some fun in the kitchen. To say we had a lot of food is an understatement. As you will soon find out, our eyes tend to be bigger than our stomachs, but that’s the fun part, right?! I have posted a photo of the finished product. We each had a steak, a lobster tail, shrimp skewer, corn on the cob. 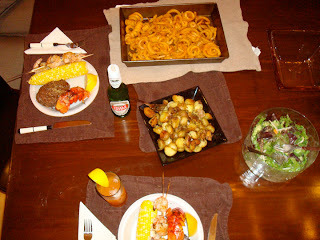 As side dishes, we made curly fries, mini yellow potatoes with sauted onions and garlic, and a salad. Of course, who can forget about one of Jonty’s favourite beers, Stella, and a nice girly homemade cocktail for myself! Since no meal is complete without dessert, we took a lesson from Jonty’s South African background and scooped out the sweet and sour grenadilla (basically a passionfruit to us Canadians/Americans). We also bought fudge from this divine little shop. The flavours pictured are cookies & cream, peanut butter, and toffee. Welcome to my world; a world filled with joy, laughter, good friends, family, and of course, lots of food! Join my boyfriend Jonty and I on this journey as we eat our way through our young adult years. 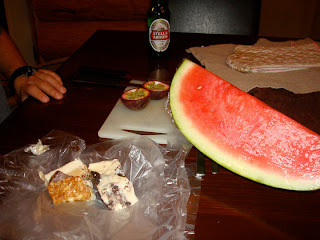 On a daily basis, we tackle many desserts (my weakness and absolute pleasure in life) and savoury foods as well. Even though Jonty has always been a meat eater, I am pleased to annouce that after meeting me, his life has become a little bit sweeter! I am so excited to have you all share in the yumminess this wonderful world has to offer!